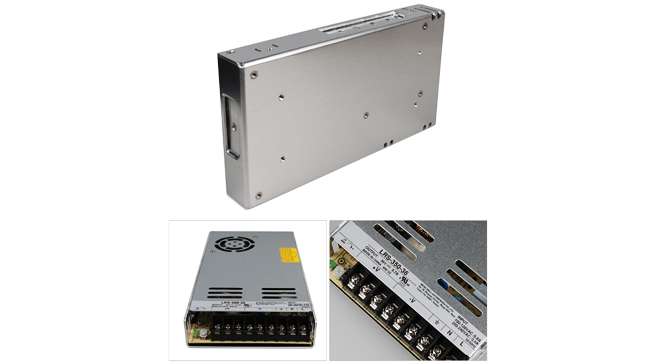 LRS-350 series is a 350W single-output enclosed type power supply with 30mm of low profile design. Adopting the input of 115VAC or 230VAC (select by switch), the entire series provides an output voltage line of 3.3V, 4.2V, 5V, 12V, 15V, 24V, 36V and 48V. In addition to the high efficiency up to 89%, with the built-in long life fan LRS-350 can work under -25 ~ +70°C with full load. Delivering an extremely low no load power consumption (less than 0.75W), it allows the end system to easily meet the world wide energy requirement. LRS-350 has the complete protection functions and 5G anti-vibration capability; it is complied with the international safety regulations such as UL60950-1. LRS-350 series serves as a high price-to-performance power supply solution for various industrial applications. LRS 12V 29A Compact PSU LRS is a new low profile form factor for industrial power supplies. It only measure 30mm in height and produce 29A at 12V. It offers great efficiency and the aluminium enclo..
LRS 48V 7.3A Compact PSU The new LRS standard is a compact form factor and is very efficient and extremely low no load power consumption. The LRS-350-48 series has been designed for use within dema..
LRS 24V 6.5A Compact PSU The new LRS standard is a new compact form factor and is very efficient and extremely low no load power consumption. The metallic mesh design ensure optimum cooling. The LRS-..
LRS 3.3V 10A 50W Power Supply The new LRS standard is a compact form factor and is very efficient and extremely low no load power consumption. The LRS-50-3.3 series has been designed for use with..